For many years, I’ve stopped at a favorite vantage point along Dufur Mill Road to photograph the massive east face of Mount Hood, framed by a trio of big ponderosa pines. In the beginning, two were living, and the third was a bleached, dead snag that stood between them. Then another died just a few years ago (the tree on the left in the photo), creating a new snag. Each year, the two snags in this trio have become more weathered, with the remaining bits bark dropping from the silver wood of the older snag, and a few more branches dropping from the younger skeleton. I watched this evolving scene with interest, but also took for granted. I was thus surprised — and saddened — to discover that these two, old sentinels had been cut down sometime this fall. They were left simply lying on the ground, in the ravine far below the road, and it’s unclear why they were cut. When I was there, a pair of grizzled men were cutting firewood along the road, a sanctioned activity permitted by the Forest Service. Yet, these two great snags were far enough below the road to represent a real chore to recover as firewood. Indeed, the men were working the uphill side of the road, where logs could simply be rolled down to their truck. More to the point, there is plenty of downed timber for woodcutting in the area, so it was unnecessary to cut any snags, much less these two giants. But somebody felled them, and this is just one price of the casual culture of tree cutting that reduces every standing tree on U.S. Forest Service land, dead or alive, to a dollar value in board feed of lumber, or cords of firewood or cardboard boxes. What a waste. So this story remains a puzzle to me. I doubt many noticed these two old snags, but they surely added to the scene in ways both aesthetic — they were majestic and photogenic — and functional, since big snags are an important part of a diverse wildlife habitat in our forests. I’d often seen crows, and even a couple of hawks, sitting in these old snags over the years, and there were probably dozens of other creatures that lived in these old skeletons, or relied on them for survival. They might have lasted for decades as bleached monuments, too. Mount Hood is dotted with century-old snags left from fires that occurred in the early 1900s, after all, since big trees like these have remarkable resistance to the elements as snags. But this pair will only remain standing in my imagination, and I’m thankful that I captured them in a few photographs over the years as a reminder of their beauty and value. This entry was posted on November 19, 2008 at 5:04 am and is filed under Cultural History, Natural History, Proposals. You can subscribe via RSS 2.0 feed to this post's comments. 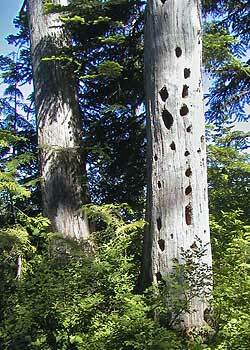 Most likely the snags were cut because they were considered hazard trees. The USFS has a policy to take down any dead tree that could strike an open road. Although it is rare that dead trees are blown over, a dead tree is gonna fall sometime soon rather than later. Green trees on the other hand are blown down frequently, but I think the lawyers have set the bar for what is required to be “vigilant” in protecting the public.